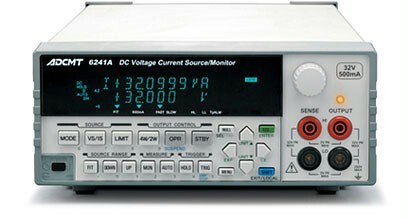 6241A is DC voltage and current source/monitor with high-performance features including source resolution of 4½ digits, measuring resolution of 5½ digits, and a basic accuracy of 0.02%. 6241A is DC voltage and current source/monitor with high-performance features including source resolution of 4½ digits, measuring resolution of 5½ digits, and a basic accuracy of 0.02%. It supplies/measures 0 to ±32 V / 0 to ±500 mA and enables extensive pulse generation and measurement functions including sweep and pulsed sweep. 6241A can generate pulse widths down to 50µs and can measure with a resolution down to 1µV/100pA. So this product can be used for a wide range of applications, e.g. as a power source for evaluations in research and development of semiconductors and other electronic components, or as a power source for a production line characteristic test system. 6241A is very well suited for the evaluation of solar cell characteristics. At the same time, the individual HI/LO limiter setting function demonstrates its power in evaluation of batteries and power source ICs. Its suspend function enables the selection of the optimal OFF state depending on the specific requirement of each application. 6241A is equipped with GPIB and USB interface in standard.